"Ralph Breaks the Internet is not as good as Wreck-It Ralph but remains, by and large, a pleasant experience." "Something worth noting about Wreck It Ralph was the manner in which it filled its world with icons of video game and candy brands, then encouraged us shed our cynicism with its own sincerity. " I’m not sure what I’m not getting when it comes to appreciating Pixar films. Somewhere along the lines, whether it be part of my genetic coding or a series of decisive life experiences, I missed out on the part of the brain that enjoys the famous animation studio’s creative output. And yet the difference between Pixar films and comparable computer animated film from other studios that I have enjoyed eludes me. Ralph Breaks The Internet isn’t a Pixar film and neither was its predecessor, Wreck-It Ralph. I enjoyed both. I also enjoyed Rango, Frozen, Tangled and Zootopia. Films like Zootopia and Ralph Breaks The Internet, I think, share a superficial as well substantial set of traits with a number of Pixar films. In regards to what they endeavour to achieve, I find it difficult to discern between them, beyond cursory elements. In Zootopia, there is a message about racial acceptance, in Ralph Breaks the Internet, there is a message about a mature attitude toward friendship, in Inside Out, there is a message about accepting accepting a union between sadness and joy. They all have jokes that appeal to adults and kids alike. The characters inhabit complementary realms. Why I like the first two films and not the third may always remain a mystery. Ralph Breaks the Internet is not as good as Wreck-It Ralph but remains, by and large, a pleasant experience. The least favourable element of the film is the depiction of the internet, which is largely uninspired considering the limitless possibility for creative achievement. 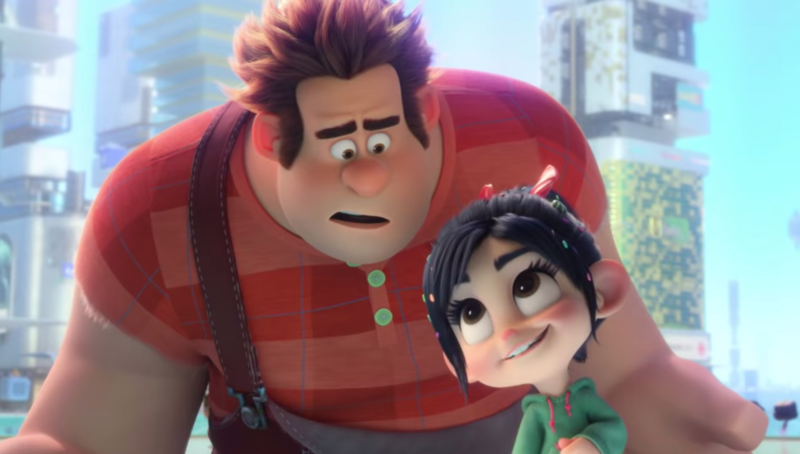 Ralph Breaks the Internet is not as emotionally affecting as the first film though, at its conclusion, Ralph becomes arguably one of the most developed characters in any computer animated film, if you consider his personality at the outset of Wreck-It Ralph. The plot involving Gal Gadot‘s character, Shank, is substandard for a top tier animated franchise, as is the showdown involving a gigantic, fleeting antagonist. The cameos from the Disney princesses were great, but I’m a sucker for 90s Disney films. Alan Menken also makes a welcome return to the company he helped revive. He’s probably responsible for a lot of your best memories, even if you don’t know who he is. In regards to what actually happens in this movie, the plot kicks off six years after the first film ended. Ralph (John C. Reilly) and Vanellope (Sarah Silverman) are best friends, inhabiting their video game matrix as happily as any pair of best friends possibly could. But Ralph’s inherent aptitude for destruction leads to the possibility of Vanellope’s game, Sugar Rush, being decommissioned from the arcade they call their home. The solution, a replacement steering wheel going for two hundred dollars on eBay, forces Ralph and Vanellope to abandon the arcade and journey into the unfamiliarities of the World Wide Web. Something worth noting about Wreck It Ralph was the manner in which it filled its world with icons of video game and candy brands, then encouraged us shed our cynicism with its own sincerity. 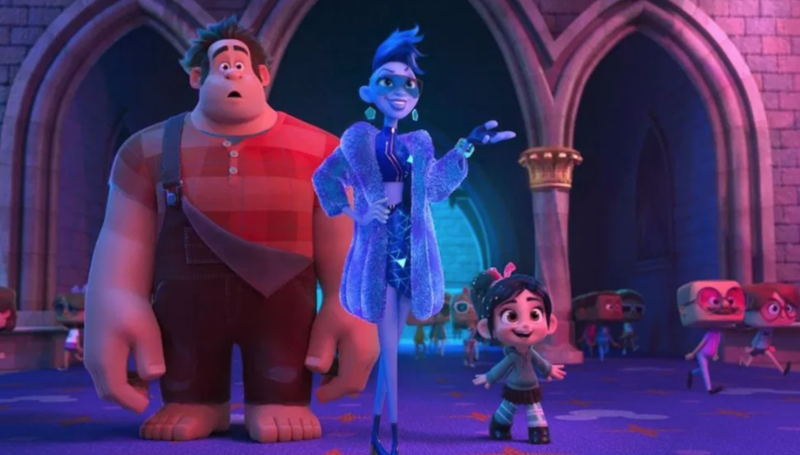 Ralph Breaks the Internet follows a similar course, on a broader scale, using entities that we are even more accustomed to adopting suspicion towards – internet companies. In both its adoption of these companies and its employment of sincerity to overcome our immediate reaction, this sequel is less successful than its predecessor. My disinterest in Pixar aside, I still don’t gravitate to computer animated kids films at the best of times and there’s a whole lot of nothing in this review because of that. What I’m saying, if anything, is that if you do gravitate towards them, there’s a distinct chance that you’ll gain a lot more in watching Ralph Breaks the Internet than I did. It is a nice feeling though, when your emotions change for the better during some of the more sentimental moments. Ralph and Vanellope are a sweet duo.